A few weeks ago, CNN news host and new radio personality, Don Lemon, cajoled the black community – black men in particular- that we would all see a change in our life outcomes if we would just do better at a few things. He gave five points that he thought would help us collectively find our ways. And just this week, he teamed up with America’s favorite dad, comedian Bill Cosby, to further admonish the black community at-large. Prompted by the original inner city gangster, Fox News personality Bill O’Reilly, Lemon felt the need to expound on some criticisms O’Reilly had of the black community. Lemon, our loquacious sage of a media personality, seems to think that the black community’s problems really boil down to five main things. Now, I honestly believe the intent here was positive. Sagging is simply unattractive and stupid for all the reasons Lemon noted (like it having ties to prison yards). The “n” word is unacceptable in conversation, entertainment, or humor. And, it goes without saying that littering should be avoided by anyone regardless of race. But, Lemon’s final two points are definitely issues the black community should take heed of. We consistently post lower than average high school graduation rates and boast the highest out of wedlock birthrate in the country. So, there’s that. But, the disturbing part about Lemon’s ongoing melodrama with his own community is his insolence on screen and radio. His tirades continue to place the blame squarely on the shoulders of those with whom he holds ire. Black people, to him it seems, need to correct THEMSELVES if they are going to be successful. This, he notes, while ignoring structural biases and institutional racial issues which permeate virtually every system in place in this country. Sadly, stories like those of Ferell and Trayvon Martin disprove the notion that self-correcting will solve anything. In the case of Martin, he was targeted, chased, gunned down, and subsequently placed on trial posthumously after George Zimmerman racially profiled him on a cold dark evening. Using a loaded weapon, Zimmerman approached Martin, a 17-year-old young man, with the intention of preventing a crime Zimmerman suspected Martin of potentially committing. In the end, Martin was shot to death. Similarly, Ferrell, in much the same position except swap Zimmerman with armed police, was killed after seeking assistance from a woman in a nearby home where his car was crashed. Ferrell’s murderer will likely be found guilty of murder. But, just like Martin, Ferrell’s only crime was being black and scary in the wrong place at the wrong time. How can Lemon seemingly imply that the black man’s plight is truly linked to his own behavior when case after case proves that putting a band-aid on the problem really solves nothing? Are black men deserving of senseless death because their pants are too low or because their skin is too dark? Is it their brown skin or the litter on the ground which results in their demise? 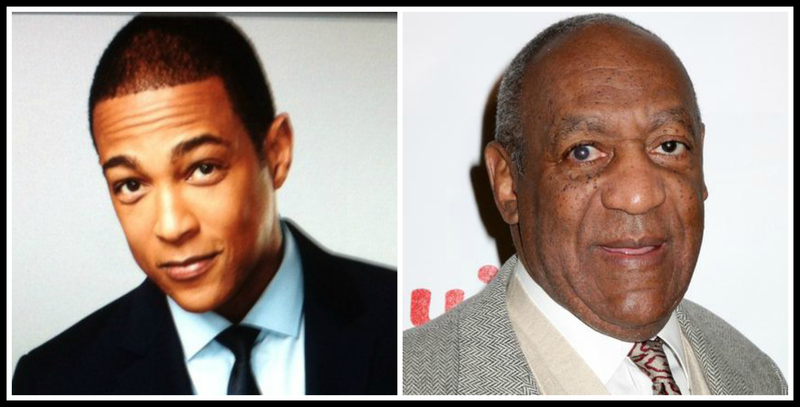 Lemon and Cosby seem to be making a side-hussle of the whole anti-black men thing. Recently referring to absent fathers as “no-groes“, the two are really enjoying their celebrity status as it helps them publicize black men’s problems. Yet, I must honestly say that I am conflicted on this whole thing. I definitely see the merits in attempting to provide advice, counseling, or other words of wisdom to a community riddled with a host of socio-economic issues. But, sometimes it just isn’t all about what you say but how you say it. Seeing Lemon, who admits to living in a white community, give advice to black males is almost as silly as Angelina Jolie giving advice to women suffering through the throes of breast cancer treatment. These people are just so far detached from the community they are counseling that it seems less like earnest concern and more like a publicity stunt. It comes off as self-important and disengenuous. And, I really won’t start on Cosby. I love him to death but I think his age is turning him into a mean ‘ol man. What the black community certainly doesn’t need is more lip service. As black mothers continue to see their children gunned down in the streets and black children continue to grow up fatherless, enough just seems to be enough with the empty nomenclature and excessive parenting from rich, “holier than thou” television personalities. It seems they truly just do not understand the struggle. It is a unique one. I myself grew up in an inner city (Oakland, CA) and everyday I girded myself with the realization that it might be my last. A fight on the school bus, an argument at the burger joint, or anything could result in my victimhood. I knew that. And, I knew that wasn’t my fault. I can’t imagine how that must feel for young black men. I can’t even fathom the anxiety, stress, fear, and isolation that must cause. Black men are in the crosshairs every single day. Whether they be the focus of wannabe cops like Zimmerman or actual cops or criminals or the like, they face uncertainty every day. It’s time these mouths find some limbs and do some good work. Start a nonprofit, lobby Congress, teach at a local college, or create some forums to discuss the status of the black community. But, mouthing off really solves nothing. And, it just makes these folks look like insensitive, out-of-touch douches. Next story Fall TV Review: Marvel’s Agents of S.H.I.E.L.D.